Fever Sleeves: “Futuristic Killings” Video | Chickens Don't Clap! An awesome new music video from San Diego progressive tech-pop riffers Fever Sleeves (full disclosure: these guys are friends) hit the web this week. You may recall “Futuristic Killings”, the A-side from their recently released debut 7-inch, from my original post a few months back, but this song kicks as hard as it did when I first heard it. The video finds the too-much-fun-loving ghost figure from the album jacket, dubbed Ghordon Ghost, stop-motion animated in a quest to “find a place of his own”. Leaving his home (the Armadillo-Tank on the cover of “Tarkus” by Emerson, Lake & Palmer), Ghordon voyages across a myriad of albumscapes before settling on the “Futuristic Killings” 7-inch. According to a recent blog on their myspace, their debut full-length Soft Pipes, Play On is “97% done” and will see a digital release “very soon […] with a very special album release show/party to follow soon after”. So, keep your eye out for that. And since these guys are one of the best things coming out of San Diego, I’m sure you’ll be reading more about it here as the details unfold. 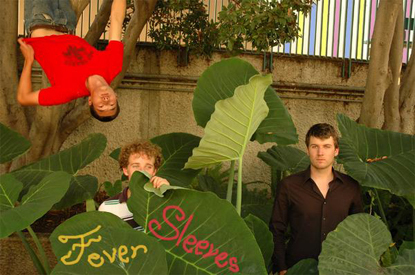 Fever Sleeves are also still deciding on where to release the CD & Vinyl formats of the album. To any reps that might be reading this: if your label wants a piece, get in there while you can. Buy: The 7-inch is available for $5 (PPD) through PayPal over at the Fever Sleeves’ myspace. Orders include a CD-R for mp3 ripping ease. Buy: From the Black Box Vol. 1 compilation, which is available in digital or CD format on Amazon. You can also send an e-mail to Black Box Studios and order it directly.